Feel amazed by this modern contemporary condo designed by the Free Space Intent in black and white. Colorful accent pieces and contemporary art work adds a pop of color to the decor. 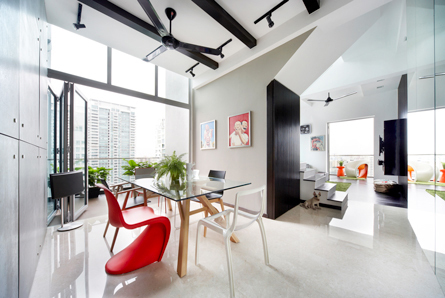 Unique architectural elements of the condo such as staircases, ceilings, large glass windows and doorways are highlighted by the modern minimalist furniture. Dining table with transparent glass top and colorful chairs in different styles gives a beautiful visual appeal to the room. Similarly, colorful wall art and large size wall clock brings cheer to the living area with monochrome furniture. Parrot green shag area rug gives a refreshing look to the media and entertainment area. The spacious condo with abundance of natural light and minimalist modern furniture looks bright and inviting. Black beams on the ceiling, black ceiling fans and ambient lights create quite a drama at night. Modern contemporary interior design with clean lines creates a beautiful harmony and balance. The entire condo is designed in a subtle and graceful manner. It looks like a timeless piece of art.